Enjoy a classic cruise experience aboard the Sun Princess accompanied by a taste of the Red Centre, Top End & Western Australia. Tour the iconic Red Centre and explore the Field of Light art installation on a self-guided walk after dark. Witness the breathtaking scenery of one of the world’s most extensive coastal wilderness areas as you cruise aboard Sun Princess. Experience an immersive overnight stay in the Margaret River region. 5 day Red Centre Highlights tour including accommodation, tours and transfers. Field of Light pass including transfers. Flight from Alice Springs to Darwin. 3 night stay in Darwin at the DoubleTree By Hilton Hotel Esplanade Darwin including breakfast. 24 hour Hop-on Hop-off Bus pass. Charles Darwin Sunset Buffet Dinner Cruise. 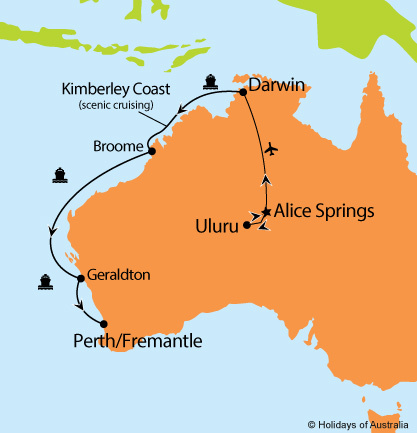 7 nights aboard Sun Princess from Darwin to Perth with scenic cruising along the Kimberley Coast and port calls in Broome & Geraldton. Your cruise includes on board meals and entertainment. Transfer from the cruise terminal to your accommodation with a half day Perth City Sights tour. 2 day Margaret River Wine Experience tour.